. The series, if funded, is slated to be held on alternate Thursdays from June 24 to August 19, with a final September 11 Candlelight Vigil concert to be held on Friday, September 10. Help us continue to support our local musicians with these groovy concerts in the park! One of Riverwest’s six “assessment neighborhoods” had the highest percentage increase in property values. Read next month’s Currents for in-depth coverage of local assessments, development, and gentrification in Riverwest. Riverwest continues to get attention in the local media. Milwaukee’s Channel 10 is taking a look at the neighborhood in a Milwaukee Public Television documentary by producer Dan Jones to run Thursday, May 20, at 9 p.m. “Milwaukee’s Riverwest Neighborhood” explores the “ethnically diverse collection of artists, students, young families and longtime residents,” according to a press release. Jones and Riverwest Currents editor Sonya Jongsma Knauss will participate in an “At Ten” show on WUWM, 89.7 FM in May (see www.wuwm.com for program time). Jones has produced award-winning documentaries about other Milwaukee neighborhoods including Brady Street and the Third Ward. Videotapes are available from MPTV at $25 each. Call 414/297-7540 for more info. Celebrate May Day with a bike ride starting at noon at St. Stanislaus Church, 524 S. Mitchell, to Cupertino Park in Bay View. Join the park picnic for live music by Eric Blowtorch and Dreamland Faces, plus kickball and capture the flag, to celebrate Milwaukee’s Labor heritage. Tis the season for sewer projects. Now that the city has wrapped up its extensive work at Auer and Booth and moved off Clarke Street, other projects are cropping up. A sewer project at Humboldt and Locust began in mid-April, and with the 10-day delay thanks to a broken pipe, is expected to be back under construction until late May. Humboldt will be closed between Locust & Chambers on the west side of the boulevard, with two-way traffic on the east. Locust Street will be closed between Humboldt & Weil. The project involves going down 70 feet to replace the sewer lining. Michael’s Construction should be able to complete the work well in time for the Locust Street Festival, officials said. Another sewer project on Fratney and Townsend began in April and is expected to be finished in June. Sculptor David Middlebrook polishes the marble “glacier” base of the piece that will be installed in Gordon Park. Middlebrook expects to install the sculpture near the end of May, in time for Riverwest’s Independence Day Celebration, held this year on Monday, July 5. A dedication of the artwork will most likely be held in the fall. The Wisconsin Community Fund (WCF) has awarded $50,000 in grant money to 10 Wisconsin based grassroots organizations engaged in social justice advocacy, including the Peace Education Project of Peace Action. The group, based on Weil and Keefe, is organizing an anti-racism initiative in Riverwest, including anti-racist workshops, mediation services, and diversity celebration campaigns. Governor Jim Doyle has signed the Homeowner Protection Act in response to an increase in unscrupulous home lending practices and an alarming increase in foreclosures due to these loans. Predatory loans are designed to strip homeowners of the equity they have in their homes and generate huge fees for the lender, regardless of the borrower’s ability to pay back the loan. Work continues on the bridge over the remnants of the North Avenue dam. This pedestrian bridge is an integral part of a loop hiking trail that will link the east and west banks of the river between Locust Street and North Avenue. Caesar’s Park is the east landing of the bridge. The park, which is mostly slope, has had extensive landscape work. Trees have been thinned and the slope planted with native perennial species. Garden Park and Gardener’s Market should become permanent green space for the Riverwest community. The city has recently taken title to the land. Contamination of the groundwater, due to dirty fill that was placed in the foundation of the long defunct Pulaski building, kept the property in limbo for years. A state program to develop a remediation plan for the site has awarded the city a $125,000 grant to implement a solution agreeable to the State Department of Natural Resourses. The neighborhood can have input into this plan. The resulting greenspace will be community run and most likely owned by Milwaukee Urban Gardens, a non-profit land trust. Meet Mike and Mike. The aldermen now serving the redrawn 3rd and 6th Aldermanic Districts that encompass Riverwest are Mike D’Amato (right) and Mike McGee. D’Amato, who is beginning his third term as alderman, defeated challenger Carol Wehner for the 3rd district seat, losing just three wards (39,44,46) near UWM. D’Amato received 57% of the vote. McGee defeated long term incumbent Marlene Johnson-Odom. McGee won 17 of 24 wards and 53% of the vote. Central Library and Martin Luther King Library on Locust and King Drive have increased their hours of operation. Central Library will be open on Thursdays until 8:30 p.m. The drive-in window at Central Library will be open until 6 p.m. on Thursdays. Martin Luther King Library adds Fridays, 9 a.m. to 5 p.m., to its current schedule. A complete list of library locations and hours can be found at www.mpl.org. The third annual Cinco de Mayo celebration and fundraiser for the Juana Gloria Vega Scholarship and the Juana G. Vega resource center will be held Tuesday, May 4, from 4:30 to 6:30 p.m. at the LGBT Community Center, 315 W. Court St. It will feature a silent auction, complimentary Latin American food and refreshments, and performances by Ballet Folklorico Mexico de los Hermanos Avila. Para mas informacion: 414/745-1517. The poor air quality in eastern Wisconsin will get worse faster if Southeastern Wisconsin freeways are expanded, Citizens Allied for Sane Highways (CASH) said Friday. The SEWRPC (Southeastern Wisconsin Regional Planning Commission) push to tap taxpayers for $6.25 billion to build bigger freeways would destroy not only homes, businesses and wetlands, but air quality as well, CASH co-chair Robert Trimmier said. CASH is a coalition formed to oppose freeway expansion in Milwaukee. “Not only will air pollution be worse in Door County and Kewaunee County because of bigger freeways in Milwaukee, people living in those counties will be paying higher taxes to pay for the Milwaukee freeways,” Trimmier said. Last month the EPA officially designated Sheboygan, Manitowoc, Kewaunee, and Door Counties as exceeding federal ozone standards. Ozaukee, Washington, Milwaukee, Waukesha, Racine and Kenosha Counties already exceed the standards. A Make Coke Broke Art Show was held April 24 at The Green Dragon Cafe. The workers of bottling plants in Columbia face many injustices including murder for being involved in union activity. Compa works to “educate people on the issues of globalization and organizing actions to create a just world.” For more info call Jonathan at 414/708-9878. WMSE kicks off its Spring Membership Drive on Monday, May 3 at 9 a.m. Help them raise the $100,000 they need to keep the non-commercial radio station alive and well. Tune in or log on to WMSE for a complete schedule of musical guests. 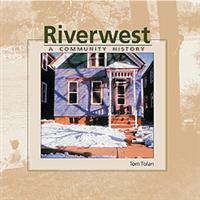 Tom Tolan’s book, Riverwest: A Community History, will receive three prestigious awards in May and June. The awards include one from the Milwaukee County Historical Society and the August Derleth Nonfiction Book Award. On June 12, Tom Tolan and COA Youth & Family Centers (the book’s publisher) will receive the Wisconsin Historical Society Book Award of Merit. Milwaukee writer and historian John Gurda called the book “a captivating chronicle of a unique Milwaukee neighborhood.” The book documents 170 years of Riverwest history, focusing on the events, organizations, and people who have shaped what we are today. In the book’s forward, COA’s Executive Director Tom Schneider writes, “Riverwest is politically active, artistically alive, racially diverse, and of course, uniquely intertwined with the river.” The book is available at the Riverwest Coop, Outpost, Schwartz books, or by calling or stopping in at COA Youth & Family Centers.